Ham you heard about the Goose Gang? As meat monger Kevin celebrates five years smiling behind the counter, Goose is excited to announce his new position has Head Butcher. Happy anniversary and congratulations, Kevin! One of Kevin's most delicious memories is from a trip to visit family in Spain just after turning 21. Every bar had different tapas, but when they pulled up a stool at one in the shadow of the Alhambra, slices of dry cured ham helped make the memory. "Sitting in the night in this ancient city, with family I hadn't seen in too long, enjoying this beautiful dry cured meat, and having this amazing palace lit up across the road from us... Pretty great." Kevin is as passionate about the artistry and sourcing of butchery as he is about the dinner on your table. His excitement is contagious whenever he answers what would make the best dinner from today's meat case. Backed by years of hands-on experience, he's a trusted and jolly source whether seeking that special, specific cut or simply seeking suggestions. That expertise combined with a gentle spirit makes Kevin a rare cut (wink). Help us celebrate his fifth goosiversary and a well-deserved promotion. Congrats, Head Butcher Kevin! Speaking of celebrations, Kevin's ham-ing a party... Register for his new seated, guided Ham Classes! 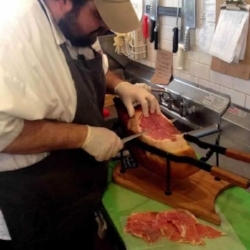 In June, he'll lead a tasting of five domestic hams followed by July's class featuring five hams from Italy, Spain, France, and beyond. Between bites, Kevin shares how the hams were made and what makes them special from a fellow butcher's expert training. Served up with paired accompaniments (and drinks!) plus a tasty swag bag to take home, Kevin's Charcuterie Nights are in session this summer.